Northampton Town boss Aidy Boothroyd says he is not giving any thought to new deals at this stage of the season. 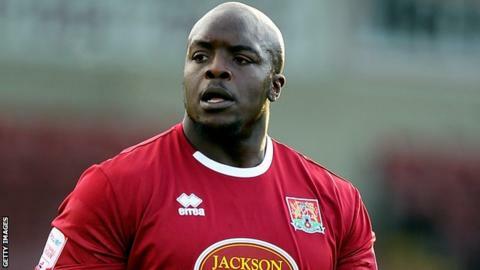 The Cobblers have 12 players out of contract in 2013, including top goalscorer Adebayo Akinfenwa. But Boothroyd told BBC Radio Northampton: "[Contracts] will be given when it's right to give them out. "Bayo can't stop scoring and I'm delighted. But the last thing you do with somebody who's doing really well is give them a bag of sweets." He continued: "You say there's going to be two bags of sweets, but you've got to keep doing what you're doing." Akinfenwa scored twice in the 3-1 win over Wycombe Wanderers, taking his tally to 12 for the season. Boothroyd added: "I rested him at Bradford, hoping that he'd light the scene up here. He's always got a goal in him, and when he plays like that, he's unplayable. "He knows if he's not putting a shift in, he'll come off or won't start, and I think he thrives on that. Sometimes if you're easy on players, they'll take advantage - it's not because he's a bad person, it's because he's a bit of a rogue. But I love working with him. "As far as contracts are concerned, I've got no interest in any of that with any of the boys who are out-of-contract, because we're only in November." The former Watford and Coventry manager says his side's recent form should be encouraging supporters, with the Cobblers' only defeat this month coming on penalties in the FA Cup by Bradford. "We're on the up here and we're moving forward," he said. "That doesn't mean we won't have a few steps backwards and some poor results. "We've got a lot to be happy about, but you can't get carried away." Meanwhile, Akinfenwa says that a team-talk by injured striker Alex Nicholls helped the side before their first home win of the season. "I broke my leg four or five years ago and there's nothing worse for a footballer," said Akinfenwa. "He said he wants to be out there with us but he can't, so he said to go out there and give it all you've got. "It brings a squad and a club together - it was very emotional. It spurs you on to do better."